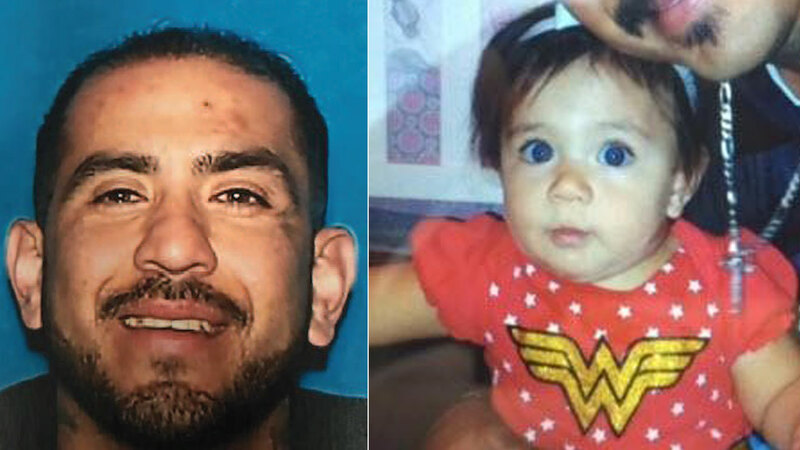 RANCHO CUCAMONGA, Calif. -- Authorities issued an Amber Alert for a 1-year-old girl who was abducted in Rancho Cucamonga by an armed suspect Monday night. The child, named Lexi Segura, was abducted by a male suspect, 38-year-old Daniel Segura, from the city around 5:40 p.m. Authorities said he is armed and dangerous. Segura is said to have Lexi in a red 2012 four-door Mitsubishi Galant with the license plate 6WEE209. He is described as standing 5 feet 5 inches tall, weighs about 170 pounds, with brown hair and brown eyes. He was last seen wearing a dark T-shirt, dark baseball cap and blue jeans.Authorities said he also has several tattoos on his arms and neck. Lexi was last seen wearing a baby blue shirt with gold writing on it, blue jeans and pink shoes. She has brown hair, brown eyes and weighs about 35 pounds. Anyone who sees the vehicle or little girl is urged to call 911 or the San Bernardino County Sheriff's Department at (866) 346-7635.